Another version of landscape elements at Lake Mungo in printmaking media that consists of a roll up, chine colle and collagraph. I returned to collagraph but thought I’d try it on metal plates instead of the more malleable wood or cardboard. However metal leaf as a part chine colle was not compatible as both attracted each other except in this case where the metal leaf had already been placed onto paper. The process started unexpectedly when I had been working on a viscosity method of printing and had a ghost print left on my roller that looked more interesting than the viscosity print so I rolled it onto a sheet of BFK Rives 300 gsm and let it dry. I noticed a square sample of gold leaf on red paper that I’d put away for later that matched the ghost roll. So the bright yellow of the roll left over from a viscosity print had picked up a red layer from the viscosity print and melded into the yellow layer. I made a collagraph with scrunched tissue paper and carborundum in the shape of a dune glued and sealed onto a metal plate. I inked the plate with blue black and raw umber with plenty of extender (maybe more would have lightened it a little). The plan for the darker layer was to tone down the layers beneath and tie together the gold leaf on the chine colle and the rather cool almost acid background yellow. I love the art of the East and its textural nuance with which this prints seems to have an unexpected affinity but I’m not sure whether it quite captures the moonscape of Mungo. It does something else I think perhaps pointing me in another direction? 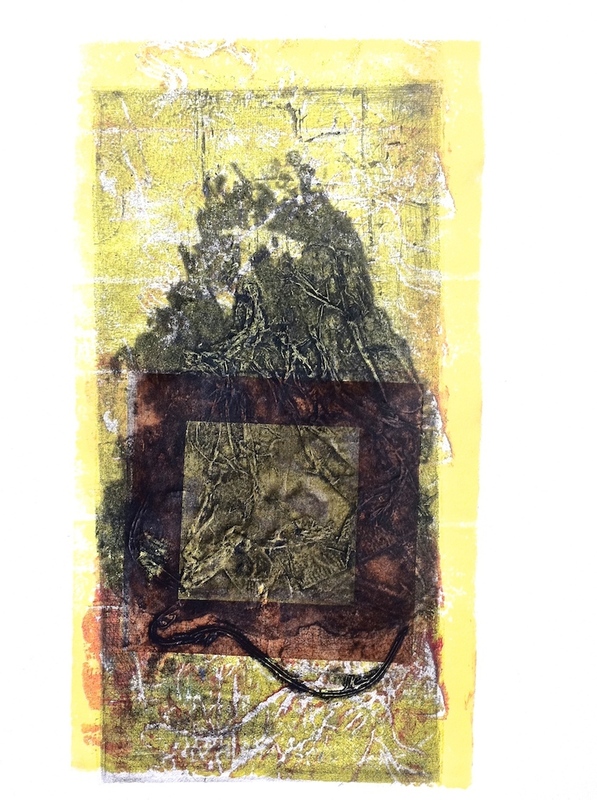 Categories: Collagraph, Mixed Media | Tags: collagraph, contemporary landscape, Lake Mungo | Permalink. Serendipity and making use of happy accidents is what makes results so exciting. Lovely print – maybe it is a new direction, it certainly has an oriental feel. the textures are awesome, love the overlapping layers on on this!